SEATTLE (AP) — Aaron Rodgers and Russell Wilson have faced off in a few memorable games in Seattle, from the “Fail Mary” to an unforgettable NFC championship game that sent the Seahawks to their second straight Super Bowl. For the fifth straight regular season — and the seventh time overall since 2012 — Green Bay and Seattle will meet again on Thursday night, but this time it’s positioning in a jumbled NFC playoff picture at stake. Washington, New Orleans, Chicago and the Los Angeles Rams are the division leaders in the NFC, leaving a pile of seven teams — including Seattle and Green Bay — within a couple of games of each other likely competing for the two wild-card spots. And every advantage or tiebreaker in that race — such as a head-to-head victory — could end up being crucial. Seattle (4-5) has dropped two straight after winning four of the previous five, and hasn’t lost three straight since the middle of the 2011 season. Green Bay (4-4-1) snapped a two-game losing streak with a 31-12 thumping of Miami last week. The “Fail Mary” in 2012, the 2014 season opener when Seattle raised its Super Bowl banner and the NFC title game after the 2014 season are the only three times Rodgers has lost to the Seahawks in his career. The past two matchups with Seattle have been among Rodgers’ best, throwing for 311 yards in a 17-9 win to open last season and in 2016 posting a 150.8 passer rating in a 38-10 Green Bay rout. He also has the distinction of having won in Seattle — although that came 10 years ago. 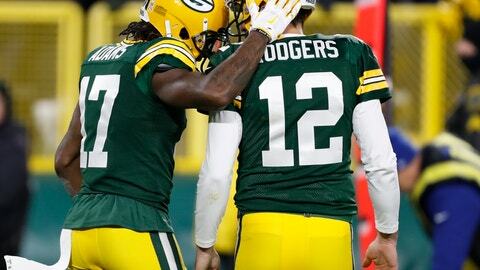 Rodgers and Wilson are being helped this year by improved run games that are among the best in the league. Green Bay’s Aaron Jones leads the NFL in yards per carry, while Seattle has the No. 1 rushing offense and last week rushed for 273 yards against the Rams without starting running back Chris Carson. Seattle expects Carson to be available after missing last Sunday’s game with a hip injury. If Carson can go, he will be the starter. But Seattle finally saw the promise of rookie first-round pick Rashaad Penny last week when he rushed for 108 yards on 12 carries and a touchdown. Penny showed the burst and big-play ability that had been missing through the first half of the season. Expect Penny to get additional chances no matter Carson’s health as the Seahawks look to use its three-back trio — Carson, Penny, Mike Davis — all of whom have 100-yard rushing games this season. Another week, another lineup shuffle likely in the Green Bay secondary. Kentrell Brice was walking in the locker room with a boot on his left foot early in the week, making it appear unlikely that he will be ready to go on a short turnaround. The Packers traded Ha Ha Clinton-Dix to Washington two weeks ago. Jermaine Whitehead was released last week. No Brice would mean probably mean veteran Tramon Williams and second-year player Josh Jones starting at safety. Kevin King (hamstring) also appears likely to miss another game, while fellow cornerback Bashaud Breeland (groin) was limited during the week. Tight end Jimmy Graham is returning to Seattle for the first time since signing with the Packers as a free agent in the offseason. With just two touchdowns so far this year, Graham perhaps hasn’t had quite the impact in the end zone as in 2017, when he had 10 scores with Seattle. But with 33 catches through nine games, Graham in on pace to match the production he had with the Seahawks. He’s also taking pride in his run-blocking, and his part in helping Aaron Jones run for career highs of 145 yards and two scores last week. Because of the quick turnaround from last Sunday several players have been ruled out. Along with Brice and King, the Packers have also ruled out wide receiver Randall Cobb and linebacker Nick Perry. Seattle linebacker K.J. Wright was listed as doubtful because of a knee injury that knocked him out of last Sunday’s game early. Carroll said Wright would be a game-time decision. Seattle sat Carson and guard D.J. Fluker against the Rams and both appear set to play against the Packers.